Below are the wind center fixes and the track made from them for Tomas. The fixes were determined during post-processing using methods developed by Dr. Hugh Willoughby and represent the center of the tropical cyclone's wind field. Some fixes may be excluded, usually due to closeness to or incompatibility with other fixes. On occasion, interpolated points were included to make the track reasonable. The reference altitude and source aircraft of the fix are also given, since for weak or sheared systems the wind center may not be aligned vertically. Following the fixes are the start and end times of inbound and outbound legs of the aircraft, used to make horizontal profiles of the storm. The centers are connected into a continuous track by using a series of spline curves with varying degrees of curvature. The latitude and longitude positions were output every two minutes to make the track file. Please note that this track is NOT the same as the NHC Best Track. That can be found here. This track is to be used with wind and sonde data for flights into this storm, but caution should be used when using this track with other data, such as radar. 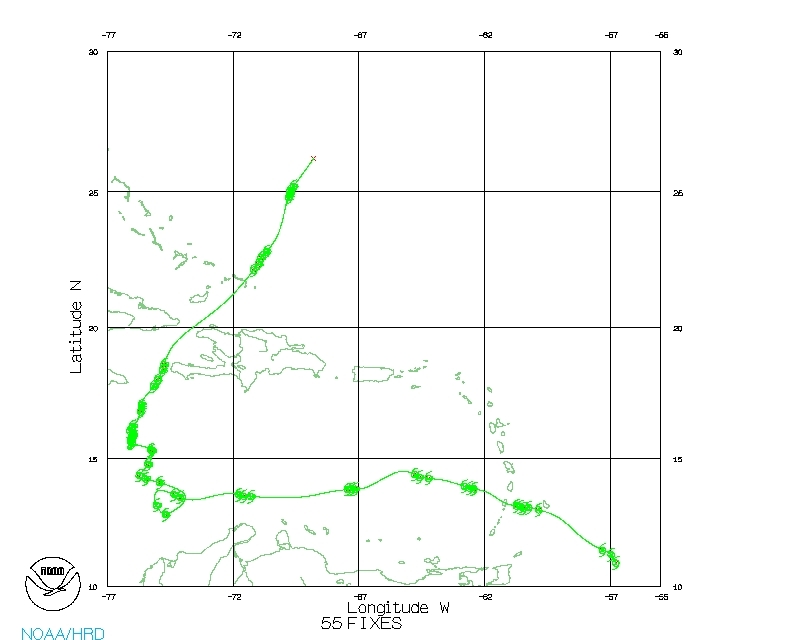 The wind field track is not the most conservative measure of storm position, and may include many small wobbles due to trochoidal motion of the wind center. Willoughby, H.E., and M. B. Chelmow, 1982, "Objective determination of hurricane tracks from aircraft observations", Mon. Wea. Rev., 110, p.1298-1305.